The No. 15/16 Marquette University men’s lacrosse team locked up a berth in the BIG EAST Conference semifinals with a 14-10 victory over Providence on Saturday afternoon at the Ray Treacy Track and Field Complex. Graduate attackman Jordan Greenfield posted his fifth hat trick of the year for the Golden Eagles (10-3, 3-1 BIG EAST), who spotted PC a four-goal edge to begin the game. Nine players scored for MU, including redshirt junior midfielder Kyle Whitlow who broke Tyler Melnyk’s program goal record with his 60th career goal early in the second quarter. Long-stick midfielder Liam Byrnes turned in another stellar all-around effort with six ground balls, three caused turnovers and a pair of assists. Michael Perettine and Will Mazzone each scored three goals in the fifth-straight defeat for the Friars (4-7, 0-3 BIG EAST). Providence held a 38-35 edge in shots and won the ground ball battle, 26-24. Providence took control early as the Friars capitalized on their first four shots after winning the first four face-offs. 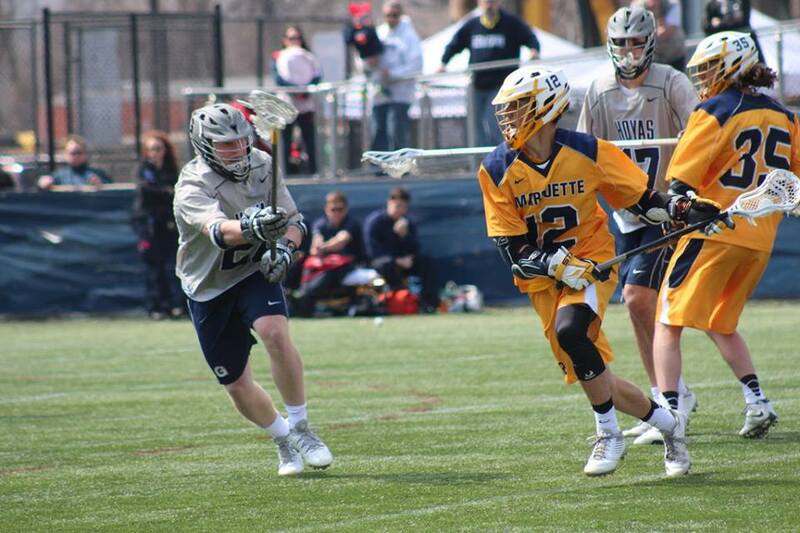 Junior Gyphin Kelly and freshman Owen Weselak were each inserted at the X for one draw before Marquette head coach Joe Amplo went to long-stick midfielder Tyler Gilligan, who won nine-of-20 on the day. McNamara got the Golden Eagles on the board with 6:14 remaining in the opening quarter and MU added goals from Grant Preisler and Greenfield in the first. Whitlow’s program record-breaking goal came with 14:14 left in the second quarter on a feed from McNamara, starting a 7-1 run for the Golden Eagles that spanned the half. Blaine Fleming, who netted his first career hat trick Tuesday at Notre Dame, continued his hot play with a goal to close out the first half, giving MU an 8-6 edge heading into the break. The junior also added another goal midway through the third quarter. Sophomore attacker Kyran Clarke scored just over two minutes into the second half for the Golden Eagles and Henry Nelson added his lone goal of the day with 11:32 to play in the third as MU took a 10-6 lead. The Golden Eagles return to action on Saturday, April 18 in the HEAD Coaches Classic against No. 7 Duke at Hart Park. The game is slated for 1 p.m. Central time and will be televised live on CBS Sports Network with Dave Ryan and Evan Washburn on the call.